Celebrate mom or the mom-like person in your life at one of these restaurants and bakeries preparing special Mother’s Day offers and menus. Afternoon Tea at Sweet Butter Kitchen, plus extra special dishes. This Sherman Oaks hot spot for relaxed outdoor urban dining is offering an Afternoon Tea from 3 p.m. until closing. Reservations must be made 48 hours in advance. It includes: Tea Sandwiches (Italian Tuna, Egg Salad, Curried Chicken Salad, Smoked Salmon & Boursin, and Cucumber & Herb Butter), Tea Sweets (Mini Scones, Mini Cookies, French Macarons, Baker’s Special of the Day), plus Fresh Fruit & Cream. A choice of beverage includes Intelligentsia Hot Coffee (caf or decaf), Assorted Regular or Herbal Tea, Sweet Butter Homemade Pink, Lemonade, Intelligentsia Classic Iced Tea, or an Arnold Palmer. $ 18.95 per person. for group of 6 and under; $25 per person for more than 6. Reservations may be made via phone (818) 788-2832 or via email marlasweetbutter@aol.com. Can’t make it for Mother’s Day? 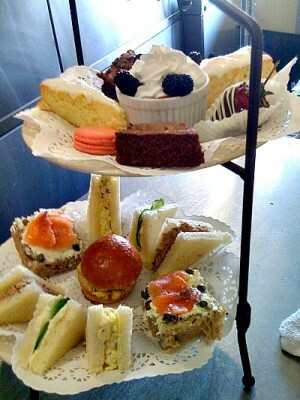 They offer the afternoon tea daily with a 48 hour reservation policy. 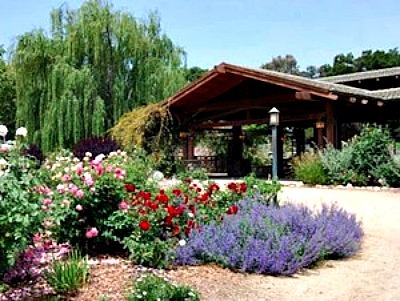 Pamper mom and the special women in your life at this brunch in Descanso’s beautiful Rose Garden. Patina chefs will create a scrumptious brunch sure to tempt every palate. Saturday seatings: 10 a.m. and noon. Sunday seatings: 9:30 and 11 a.m., 12:30 and 2 p.m. $47 per person $19 children 4 to 12; free 3 and younger. Reservations required by May 8, 1418 Descanso Dr. La Cañada Flintridge. Reservations: (818) 790-3663 (must be made by May 8). Make a reservation at Nesmon Cafe for a tablecloth decorated table and a free dessert for mom — and check out the French home imports in the quaint gift boutique. Get that Parisian feeling at this small neighborhood gem for breakfast or lunch. Enjoy crepes, omelettes, sandwiches, salads, tartines, pastries and their new vegan menu. Special for Mother’s Day, make a reservation and they’ll set up a table with a tablecloth decorated with fresh lavender. Moms also get a free dessert. If you need a gift, it’s a one stop shop full of French antiques, vintage look aprons, imported food products and more. Create your own gift basket and it’ll be wrapped and waiting for you. 13333 Ventura Blvd Sherman Oaks, (818) 855-8818. Bring mom some delicious organic goodies for Mother’s Day— Raspberry Lemon Whoopie Pies, Chocolate Whoopie Pies, French Silk Pie, French Silk Pie Bars, Strawberry Cheesecake Bars and Fresh Lemon Curd Cupcakes. 13722 Ventura Blvd., Sherman Oaks, (818) 387-8538 . This old-fashioned style bakery/gift shop with a modern twist is offering a selection of specially baked goodies for Mom. The selections include: Mom Tattoo Cupcakes, MOM (fondant) Cupcakes,Pastel Rose Cupcakes, MOM Sugar Shortbread,Chocolate-Dipped Strawberries and Mini Pies (Coconut, Lime, Chocolate-Malted, Cherry, Apple andHeart Shaped Cherry Almond Hand Pies). 12182 Ventura Blvd, Studio City,(818) 508-5855. Known for its signature frosting filled cupcakes and pudding (individual and large bowls) , there are also homestyle layered cakes, pies, puddings, cheesecakes, cookies, brownies, bars and more for the holidays. Special for Mother’s Day and the month of May are custom decorated cakes, fresh berry cakes, PB & J cupcakes, blueberry crumble pie and coconut cream pie. 23653 Calabasas Rd., Calabasas, (818) 591-2223. Find edible cherry blossoms, glossy pearls, woven baskets, Chanel handbags, holiday themes and more. John and Susan Rota create culinary works of decadent sculptured art at their Encino bakery where they also teach what they know in decorating classes.17233 Ventura Blvd., Encino, (818)- 501-3918. This small bakery is in the back of a strip mall, but its cases are filled with an array of beautiful and delicious baked goods. Celebrate Mom with a fresh Strawberry Shortcake, on special for $25 (originally $32). 19948 Ventura Blvd., Woodland Hills,(818) 346-1400. The selection at this bakery/cafe is enormous with an international array of sweets — from cakes, cookies, pastries, mousse, breads. You name it, they have it. And you can’t beat the prices. Be prepared to stand in line, but it moves quickly. The Milk ‘N Berries cake with its mounds of whipped cream and three berries is the best I’ve ever had. Specialty cakes must be ordered 72 hours in advance. 3614 W Magnolia Blvd Burbank,(818) 846-9100. Sit in the beautiful garden-esque dining room for either brunch or dinner. Choose three-courses of Bistro Garden favorites including Maryland Lump Meat Crab Cake, Eggs Benedict,Cold Poached Salmon and the famous Bistro Garden Soufflé in Chocolate or Lemon. Cost is $58. Dinner includes choices such as lobster ravioli, Baked Chilean Sea Bass, Maple Leaf Farm Duckling, osso bucco gremolota with Lemon Pepper Linquini, and grilled filet mignon, $65, Reservations (818)501-0202. 12950 Ventura Blvd., Studio City. This Noho latin hotspot with a great outside space will be serving up a sweet and savory three course prix fixe brunch for $35 per person. Include is a mimosa or a bloody mary infusion, plus a non-alcoholic drink. 11122 Magnolia Avenue., North Hollywood, (818) 985-8787. Sit outside on the Tuscan inspired patio and imagine dining in a Siena courtyard at this valley mainstay. The three-course menu is $38 per person and includes antipasti selections, such as zucchini blossoms, parma proscuitto and white asparagus soup. Entrees include pumpkin ravioli, black and white linguini, braised short ribs and profiteroles for dessert. Open from 10:30 a.m. to 2:30 p.m. 4100 Cahuenga Blvd. North Hollywood, (818) 985-4669. Celebrate in this serene haven, surrounded by trees and a trickling stream. The extensive buffet includes an array of hot and cold entrees and salads, waffle bar, bagel bar, fruit bar, pastry bar, raw bar and fish bar. Adults $60 full buffet/ $57 vegetarian. Children: 5-13 $1.75 x age . Under 4 Free. 128 Old Topanga Canyon Road Topanga (310) 455-1311. 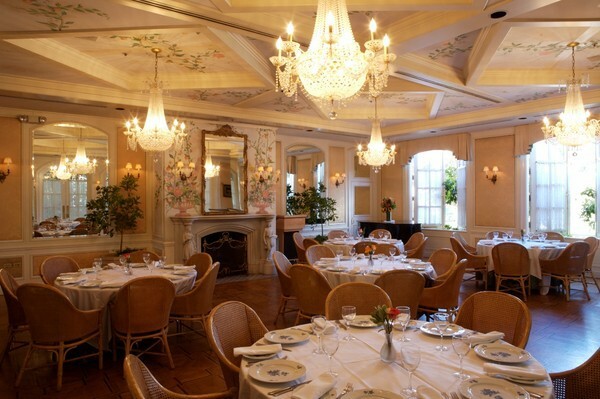 This French restaurant is serving a special brunch from 10 a.m.-4 p.m. Two courses with choices that include: Poached Eggs Benedict with French Fries, Poached Salmon over spinach with champagne tarragon sauce, Grilled Petit NY Steak with bearnaise sauce and french fries or Savory Spring Vegetable & Goat cheese tart served with mixed baby greens. All brunches are served with a fresh crossaint, bottomless Champagne, Rose Champagne, Red wine, white wine or fresh orange juice. $32/per person. The regular menu is available as well. 15013 Ventura Blvd Sherman Oaks,(818) 990-1791. Baret Lepejian’s newest restaurant is located in the former Chez Nous space in Toluca Lake and will celebrate Mother’s Day with a three course, prix-fixe brunch. Available from 10 a.m. to 3 p.m. for $25 per person, the menu will include specialties from the new concept, ranging from sushi to prime rib, in addition to light, summery dishes with a Japanese bent. A selection of baked goods and French pastries by longtime baker Laurent Soulier will also be available to go. 10550 Riverside Dr. Toluca Lake, (818) 760-0288. This casually elegant hideaway in a large strip mall is offering an elaborate Sunday brunch menu, including 23683 Calabasas Rd, Calabasas For reservations: (818) 224-2163. There’s an enormous buffet at this classic 818 destination in Studio City that includes pasta, omelette, carving and dessert stations, as well as salads and an array of breakfast and lunch items. A highlight is the “Ice Presentation” with oysters on the half shell, peel and eat shrimp, crabs legs, ahi tuna sashimi and a lox platter. Champagne, mimosas, coffee and tea are all included in the price — $39.95 Adults, $19.95 Kids 5-9, Kids under 5 Free, 20% Senior Discount. Kids will enjoy the petting zoo, jumpers and a card design station! 10 a.m. – 4 p.m. 12825 Ventura Blvd., Studio City. 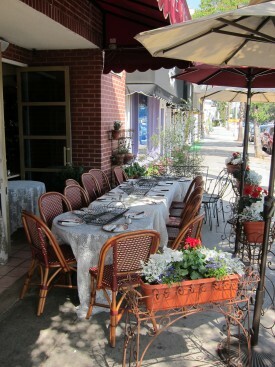 This Woodland Hills restaurant has one of the most beautiful garden patios in the San Fernando Valley. Enjoy an a la carte brunch menu with such entrees as Eggs Benedict, Eggs Dungeness, Brioche French Toast. Salmon Salad and Buttersquash Ravioli. Make it special with free flowing champagne for an extra $16. 22160 Ventura Boulevard. Woodland Hills, (818) 704-1185. Mother’s Day Brunch and dinner is a la carte at this Sherman Oaks mainstay. Get a Mimosa, Kir Royal or Blood Mary for $5. Entrees include Eggs Benedict, Strawberry Shortcake French Toast, Lobster Bisque, Sesame Peppercorn Crusted Ahi Tuna Salad, Main Lobster Cobb Salad, Poached Salmon and the Valley Inn Prime Rib. 4557 Sherman Oaks Avenue, Sherman Oaks, (818) 784-1163. WHAT ARE YOU DOING FOR MOTHER’S DAY? TELL US IN THE COMMENTS BELOW!